The Rwenzori Mountains are one of just three mountain ranges in Africa which are covered by Glaciers. The visibly snow covered peaks in this view are Mount Stanley (5109m) and Mount Speke (4890m). 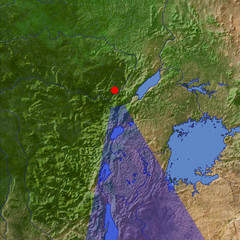 South of the Mountains to the center right of this view lies Lake Edward which drains into the Nile via the Semliki River in the foreground. 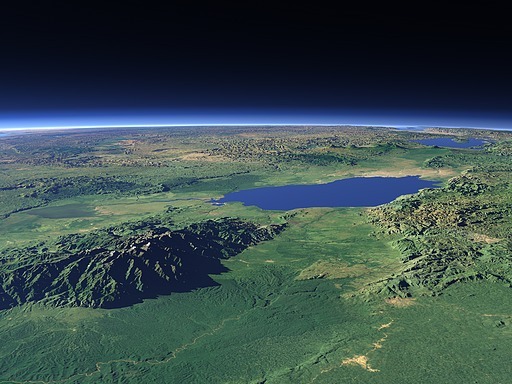 In the far background right the Virunga volcanos as well as Lake Kivu and Lake Tanganyika can be seen.